Best known for having one of the longest ski seasons in North America (often from mid-October to early June), A-Basin also boasts North America's highest elevation terrain park and its own "beach, "? the infamous early-riser parking lot, which serves as home base for concerts, parties and tailgating. When new snow at Aspen Highlands reaches mammoth proportions, you're in for a epic day of Colorado's signature light-and-dry powder. Insiders at the ski area recommend studying the trail map to find hidden gems that drop into gladed, untouched expert areas. While Aspen is known throughout the world as a posh winter playground, more skiers are discovering the mountain's challenging double blacks and chutes. In town, stop into the numerous galleries and the Aspen Art Museum or see a show at the Wheeler Opera House or the Harris Concert Hall. You can tell from Beaver Creek's marketing slogan, "Not Exactly Roughing It, "? that it will charm those looking for fantastic extras. Heated moving walkways, fresh-baked cookies in the base area and a 20-hours-a-day grooming habit result in acres of corduroy just waiting for skiers and riders to swish their way through. 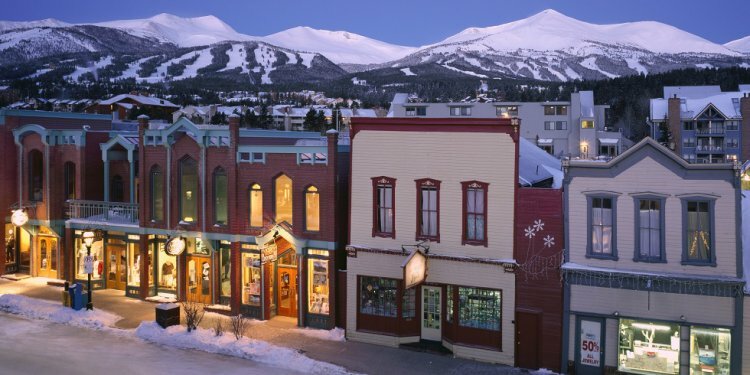 Breckenridge is one of North America's most popular resorts, in part because of its variety of terrain: long groomed trails, monster mogul runs, steep chutes, glades and lots of family-friendly beginner areas. The resort was also one of the first to allow snowboarding, and its Freeway Terrain Park is arguably one of the best in North America. Buttermilk is a great venue for beginner skiers and boarders. Wide, rolling trails are ideal for those just getting their snow legs. For an unprecedented 15 straight years, it has been the home of ESPN's Winter X Games, where Olympians Shaun White, Hannah Teter, local Gretchen Bleiler and many more have captured snowboarding medals. People who ski and ride Copper love to tout its perfect layout. They have Mother Nature to thank for arranging its slopes so adeptly: Beginner, intermediate and expert runs are each clustered with like-leveled terrain, ensuring beginners won't make a surprise trip to the top of a steep, mogul-laden run. Crested Butte has it all: wide-open green and blue trails, expert bowls and plenty of unexplored lines and uncrowded slopes. One thing to really take advantage of, however, is the CB Backcountry Guide. Professional instructors teach would-be backcountry enthusiasts how to navigate safely and explore untouched powder. Eldora's proximity to Boulder and Denver is one of the reasons it's known as a "locals' mountain."? The fact that they have terrain to keep the whole family busy all day doesn't hurt either. The Eldora Nordic Center features a network of nearly 25 miles of peaceful cross-country ski and snowshoe trails just steps from the downhill ski area. Eleven miles west of Durango, Hesperus has been an especially great option for families in the southwest part of Colorado since 1962, and it’s the region’s largest night-skiing operation. Hesperus’ unassuming, small-ski-area ambiance makes its 26 trails and 160 acres an idyllic winter escape. Routinely in the shadow of its much larger neighbor, Steamboat, it's easy to forget Howelsen's pedigree. Open since 1915, it's the oldest ski area in Colorado, has the largest natural ski-jumping complex in North America and has long been a training ground for Olympic skiers. It's also one of a handful of resorts in Colorado to offer after-dark skiing. Keystone boasts three mountains full of bowls, steeps, trails, a lift-served tubing hill and one of the state's longest ski days. Skiers can watch the sun set at 11, 000 feet and ski into the night. After a day on the slopes, a moonlight gondola ride takes you to the top of North Peak for a romantic dinner at Alpenglow Stube. One of Loveland's favorite things to brag about is its annual average of nearly 400 inches of snow, more than any other Front Range ski area. You're likely to find untracked snow even days after a storm. They have two separate base areas, one catering to beginners with wide-open terrain and one for more advanced skiers with runs steep and deep. Monarch's perch, high atop the Continental Divide, makes it one of the best spots in the state for fresh powder. A short walk from the parking lot to the lifts, roomy slopes and one of Colorado's most laid-back attitudes has made it a hit with families. Ride to the top of the narrow, between-tree Panorama Lift for 360-degree views of the divide. This resort near Grand Junction has one of the most unique views in Colorado's ski country. Located on the Grand Mesa, the largest flat-top mountain in the world, skiers and riders will see something more like the Grand Canyon than the typical alpine view. Purgatory's unintimidating slopes, Old West fun park and Pitchfork Terrain Garden beginners' park are a few things that make it a hit with families. Within its boundaries are 88 trails, five terrain parks, a racing course and 35, 000 acres of snowcat skiing and snowboarding. As Silverton's motto proclaims, this southwest Colorado ski area is "All thrills, no frills."? Colorado's highest and steepest ski mountain serves up un-groomed, no-easy-way-down expert terrain for those who prefer skiing the old-school way. Ski Cooper is famous for being the former training site for the 10th Mountain Division, the legendary World War II ski troops. Its sweeping runs follow some of the same paths used by the soldiers who skied Europe's mountain battlefields. Today, it's popular with families out for a cheerful and low-stress holiday. The mountain itself is enormous. Snowmass trumpets that 36 Disneylands could fit in its boundaries. At 4, 406 feet, "Snowmassive" also has one of the highest vertical rise of any ski area in the country, and one of the longest runs — 5.3 miles of peaceful schussing before you even have to think about the lift line. Ski Granby Ranch's fun lesson programs, easy pace and affordable prices make it a long-time family favorite. There's no better place to wind down at the end of the day than the fire pit at the base of the mountain, where the hot cocoa flows and everyone recounts the day's snowy triumphs. Steamboat feels so confident about the special-ness of its powder, it trademarked it so you'd know just where to find the genuine article: Champagne Powder. It's light, it's dry, it's smooth and it's only found in this 112-year-old western town. Despite its size - six breathtaking peaks - it still manages to stay true to its friendly, down-home roots. Affordability, friendliness and a mix of terrain are Sunlight's hallmarks. Hundreds of acres of mild greens, intermediate slopes and black-diamond extremes satisfy all abilities. The slope's proximity to the world's largest hot springs pool at Glenwood Hot Springs lets you reward your ski muscles' big day with a long soak. Driving into the authentic, Victorian-era town of Telluride, it's hard to imagine 2, 000 hundred acres of ski terrain and towering, glossy, modern resort amenities are moments away. That's because it's all hidden behind a soaring mountain ridge. A quick gondola ride ferries you to everything from refined, groomed runs to challenging moguls to freestyle parks.